I have heard a lot about the Real Techniques brushes from bloggers. I held back as cynically I wasn't sure whether people raved about them just because they were created by beauty blogger royalty Sam and Nic Chapman over at Pixiwoo (see more about them HERE). As fabulous as they both are, I wanted to make sure I was getting a brush that did what I needed it to. I already have a set of Borghese Brushes that I have been really happy with, supplemented by a few key MAC brushes. So I wasn't really on the look out to buy more. But one thing that I hadn't got was a decent brush to apply liquid foundation. To be honest I've always just applied my foundation with my fingers and had been perfectly happy with that! But continual talk of flawless skin and an airbrushed appearance drew me in. 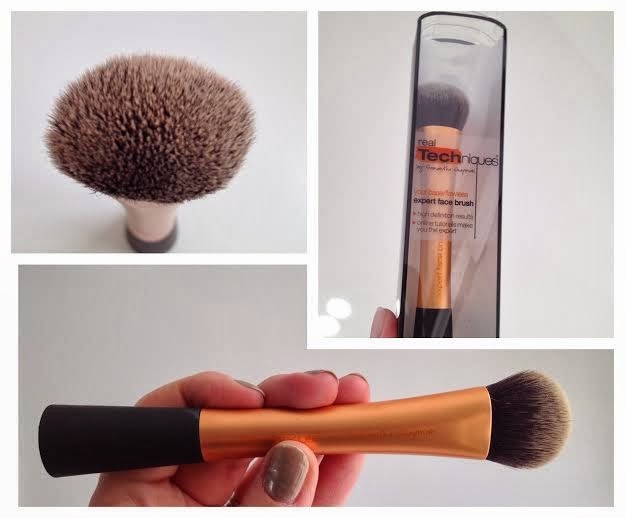 A couple of weeks ago during a Sunday night Beauty Bloggers twitter chat (#bbloggers, Sunday 8-9pm) I asked which Real Techniques Brush everyone recommended. By far the winner was the Expert Face Brush. In second place was the Buffing Brush but this is only available as part of the Core Collection Set so I decided to discount this one for now. Besides for applying liquid foundation the Expert Face Brush fit the bill. I have to say I'm really impressed! The brush feels nice in your hand, it has a wide base so you can store it standing up if you want to. The bristles are synthetic taklon and create a really firm and dense brush. I'd tried a flat foundation brush before but it seemed to just soak up all of the foundation and leave brush marks across my face. But this one doesn't! The brush feels soft on your skin but applies the foundation really easily, evenly and very quickly. It seems to blend at the same time as you apply. I think perhaps I use a bit more foundation in the process but the brush helps to get better coverage and I guess uses more product. 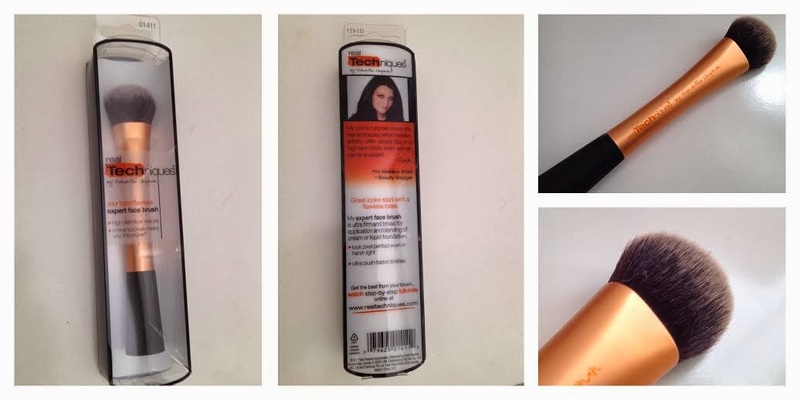 There are tutorials about how to use the brushes on the Real Techniques website (HERE). I use mine in a circular way starting at the centre of each cheek and I was surprised how quickly I could apply my foundation. I also use it blend my concealer under my eyes. Oddly I really enjoy using the brush!! Who would think you could actually enjoy this bit right? I also really like that I don't get foundation all over my hands in the process. I love this brush, it isn't often that I just really love a new product that I buy - but I do love this one! Price-wise this brush is really good value at £9.99, especially compared to my MAC brushes which are around £17 just for an eyeshadow brush! In fact I was so impressed I have also just bought the Real Techniques Blush Brush - and I'll be sure to let you know how I get on with it. Have you tried the Expert Face Brush? How does it compare to the Buffing Blush? Dare I ask - are there any other Real Techniques Brushes missing from my life (come on enable me...)? In case you are tempted to try it - I have just found a great deal on it too - the Real Techniques Expert Face Brush is at Amazon for just £6.99 HERE. The regular price is £9.99 at Boots HERE. I always forget to pick this up when I got into Boots! It looks amazing. Hopefully when I go in tomorrow I will finally remember to buy it! Yes try it & let me know what you think! I've brought this myself yesterday with the core collection as I've heard so many people rave about RT so I just caved in and brought them. The two main brushes I wanted was a foundation and powder brush, but both the expert face brush and buffing brush are amazing! I've only used it today but I've noticed a differences in how much foundation and powder was used and I found that it gives a more natural look. Personally I'm glad I invested the money into these brushes and I can't wait to buy some more, :D.
Do you find you use less foundation or more? A lot of people say less but I used more! I think I apply it very thinly when I use my fingers but get better coverage with the brush.